An important rural heritage with picturesque well preserved villages and farmsteads made up of sturdy and pretty houses. For this unique walking holiday in the Cantal you'll be based at La Boudio, a small guest house on a historic farm which has been restored to create an ideal retreat at the foot of the Cantal Mountains. The guest house provides authentic and comfortable ensuite accommodation in an exceptional location. Meals are taken in your guest house and are tasty local dishes. You'll be reserved a warm and generous welcome, as well as receiving lots of advice about your walks. Transfer to and from Murat train station and guest house, 7 night's accommodation full board including wine with evening meal. Full walking notes and maps - see example walking notes, transport to the start of 2 walks. The Auvergne is home to some of the finest mountains that make up the Massif Central. On this independent walking holiday, you'll be exploring the Cantal mountains in the southern Auvergne of France. 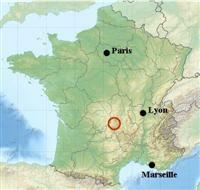 The Cantal massif is the extinct remains of one of the largest volcanoes in Europe. Erosion by ice and water has since created a series of ridges, peaks and valleys of stunning beauty that you'll simply never tire of. Beautiful U-shaped valleys radiate outwards defined by rugged and airy ridges that eminate from rocky summits. The rich green hues of the steep mountain slopes and the wild untamed nature of the mountains give them an almost British feel. Its southerly position means that it has relatively high levels of sunshine and relatively high temperatures. In addition, the Cantal has a rich historical legacy through its rural settlements and farms. The local architecture is simple yet easy on the eye, the sturdy cottages blending seamlessly into the mountainous backdrop. In this upland area, the local dishes are simple yet appetising. For example, la truffade is a typical mountain dish made from cheese, potatoes and bacon. The area is also a haven for wildlife, including birds of prey, deer, marmots, mouflon, chamois and a host of wild flowers. This independent walking holiday will suit those people who enjoy following mountainous ridges and standing on lofty summits. The daily walks on this walking holiday range from 10 - 20km in length with an average of 750m of ascent. (Maximum daily ascent 910m). The terrain is mountainous. For the most part the walking is at the easy end of the challenging grade. The paths are generally good although they can be rough and stony in places and sometimes you’ll follow minor less well-defined paths. There are some sections where you will need to use your hands for stability or progression. Alternative paths to these sections will be detailed in the notes. The holiday is suitable for the regular hill walker. Some walking experience in mountainous terrain would be a distinct advantage. Welcome in Murat and transfer to guest house at the foot of the Cantal massif. Delicious evening meal in guest house. A fairly easy ascent to ease you into the week. Once you’ve climbed out of the glaciated� valley you’ll follow a picturesque ridge to the summit of Puy de Niermont at 1620m for fabulous 360� views, providing a good overview of the Cantal Mountains. Afterwards, explore the unique landscape of the Limon plateau with moors and pastures, punctuated by small hills and valleys. Today you’ll be transported to Mandailles a lovely village in the beautiful Jordanne Valley. From here you’ll head towards the the Puy Griou a beautiful isolated volcanic peak. Those who are happy with easy scrambling can go to its top for great views. Afterwards your walk follows the GR400 path to the stunning Rocher du Bec de l’Aigle before descending to your guest house. A great walk that takes in the summit of the Puy Mary, the emblematic mountain of the Cantal range. You'll climb to the Col Serre from your B&B before following a ridge to the base of the mountain, which you’ll then traverse. The summit and descent ridge provides some of the finest views in the Cantal. Your walk then follows an amazing and dramatic ridge (pictured right) with a small section of scrambling to the Col de Cabre before descending an isolated glaciated valley back to your B&B. A chance for a breather to relax at your guest house or visit the local historic market town of Murat. Alternative walks are available for those wishing to do more walking. A great day's walking for those who enjoy aesthetic mountain routes away from the main paths. You’ll ascend the superb, rocky north east ridge of the Puy de Peyre Arse. This is a beautiful ridge ascending 700m that leads almost directly from the B&B to the lofty summit. After a moderate descent you’ll scale the various summits of the Puy Bataillouse before descending directly to your B&B. After being transported to Falgoux you’ll climb on to a beautiful and wild ridge where you can summit several small craggy tops on your way to the Col de Redonet. Here you can make the short detour to the spectacular Puy Chavaroche before contouring the cirque du Falgoux and descending to your B&B. Puy de Chavaroche - You'll be transferred to the pretty village of Mandeilles in the beautiful Jordanne Valley from where its a picturesque climb past historic, rural buildings and pasture to reach the ridgeline. Climb to the summit of Puy de Chavaroche at 1739m. Choice of routes to descend back to your guest house. 15km, +870m. Historic Villages, Lavigerie - A short walk from your guest house that explores the small hamlets close to your guest house. This is ideal as a wet weather option or if you’re looking for a partial rest day. Breakfast and transfer to Murat. Once you have booked on this independent walking holiday in the Cantal mountains of France, further information about the walking, the region and what to bring, will be sent to you. We do have a web page dedicated to what clothes and equipment you should bring. In addition, our travel shop has direct access to all the top walking and travel retailers. Please contact us if you need any further information. On this unique independent walking holiday in the Cantal, you'll be based in a small guest house in a historic building which has been restored to create an ideal retreat at the foot of the Cantal Mountains. La Boudio guest house provides authentic and comfortable ensuite accommodation in an exceptional location. You'll be reserved a warm and generous welcome, as well as receiving plenty of advice about your choice of walks. You'll be provided with packed lunches prepared by your hosts for you walks. Evening meals will be taken at your guest house. They serve tasty local specialities which will set you up nicely for the next days' walking. You have 2 main options for getting to Murat: driving or taking the train. You can also fly into a number of airports such as Paris CDG and then take the train. Eurostar and the TGV provide a services from London to Clermond Ferrand via Paris. (Note you'll need to change stations in Paris.) From there you take the regional ter trains to Murat. If you cannot get a service to match your request, phone the number on the Rail Europe website. We can organise your travel arrangements for you if needed. Once in France, the journey from Calais to Murat takes about 9-10 hours (excluding long breaks). Tolls amount to about 35 euros each way. Channel ferry crossings from Dover are provided by a number of operators including P&O Ferries & DFDS seaways. Crossings are also provided by train with Eurotunnel.